Upon arrival in San Francisco, all Chinese newcomers were taken by ferry to the Angel Island Immigration Station for the medical exam and immigration inspection. Aside from the line inspection and eye exam by medical officers, they were subjected to an invasive exam of their blood and waste products to detect parasitic diseases such as hookworms. If found with these diseases, they could seek medical treatment at the immigration hospital, but it would be at their own expense. Following the medical exam came the dreaded hearing before the Board of Special Inquiry, in which Chinese applicants were interrogated for days and asked hundreds of detailed questions about their family background, village life, and marital relations in an effort to verify their identities and right to enter the country. The same questions were asked of their witnesses, and discrepancies in their answers could mean deportation. When denied entry, 88% of the Chinese applicants chose to retain an attorney to appeal their cases to immigration authorities in D.C. and the higher courts if necessary. They usually succeeded in their appeals, but it meant staying locked up on Angel Island for an additional six months and added expenses. Because of this arduous and time-consuming process, the Chinese made up 70% of the detainee population at any time and they were detained the longest. Their average stay was 16 days compared to one or two days for European immigrants. We know that at least 200 Chinese were detained for over a year while waiting for decisions on their appeals. Confined in segregated dormitories that were deemed overcrowded, unsanitary, and unsafe by government inspectors, they were only allowed out for meals in the dining hall and for some exercise in a small, fenced-in yard. To prevent collusion on the interrogation, Chinese applicants were not allowed visitors until their cases had been settled. Their only visitors were Christian missionaries who were allowed to tend to their welfare, religious, and recreational needs. Chinese detainees complained bitterly about the poor quality of Chinese food they were served at Angel Island (food riots broke out on numerous occasions), the long delays and unfair process for the Chinese as compared to other immigrant groups, and the prison-like and dismal conditions at the station. The men organized the Angel Island Liberty Association for mutual aid and support. A few were driven to suicide, usually by hanging themselves in the bathrooms. Many others resorted to writing poetry on the walls to express their anger and frustrations. The poems you feature in the book are remarkable—could you explain who wrote them, how and where they made the engravings, and some of the common themes you’ve observed ? JY: Thanks to Tet Yee and Smiley Jann, two detainees who each copied down close to 100 poems during their stay at Angel Island, we were able to translate and include 135 poems in Island. The poets were largely Cantonese villagers in their late teens with no more than a grammar school education. Yet they knew how to express themselves in the classical forms of Chinese poetry, such as the five to seven character quatrains or parallel couplets. The most outstanding poems, those filled with historical legends, literary allusions, and personal expressions of longing, anguish, and despair show remarkable talent, maturity, and wisdom beyond their years. Some of the poems dwell on wives and families left behind or debts incurred in making the voyage. Other poems reflect a strong sense of national consciousness, decrying the unjust exclusion laws and bemoaning a weak motherland incapable of intervening on their behalf. There are also angry poems that speak of revenge. Many of the poems were originally written on the walls with Chinese brushes. The immigration officers repeatedly ordered the walls repainted to cover up what they considered graffiti. Undeterred, the poets began carving the outlines of the Chinese calligraphy with a knife to create impressions of each word. The maintenance crew was then instructed to fill in the words with putty before applying a new coat of paint. Although the putty and paint succeeded in obliterating many of the carved poems, they also served as sealers that helped preserve the wood from further deterioration. Over the years, the putty shrank and the different layers of paint cracked, revealing the carved poems underneath. So the walls at Angel Island do talk. With two exceptions, all of the poems are unsigned, most likely for fear of retribution from the authorities. Regrettably, none of the collected poems were written by women, as the Administration Building where they were kept, was destroyed in the 1940 fire. For the second edition of Island, we were able to include four poems found at Ellis Island and seven poems from the immigration station at Victoria, B.C. Like many of the Angel Island poems, these works are rough and unpolished, but they express similar heartfelt sentiments. Together, this collection of poems from Angel Island, Ellis Island, and Victoria, B.C., represent the first literary body of work by Chinese in North America. Often haunting and poignant in their directness and simplicity of language, the poems express a vitality and spirit of indomitability never before identified with Chinese America. The poems chronicle the indignity and trauma suffered at the hands of racist immigration systems, while conveying what it was like to be a Chinese immigrant imprisoned on an island. Is there one poem that stands out to you as being particularly striking? JY: Yes, poem 135 is deeply etched into the walls of a lavatory room on the first floor of the detention barracks. 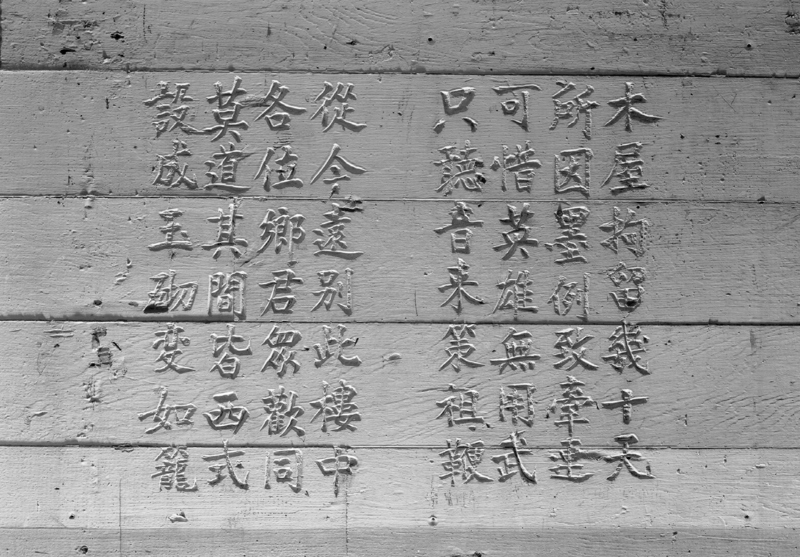 Written by a Chinese Mexican waiting to be deported to China in the early 1930s, it is the most visible and among the most poignant poems found at Angel Island. It is all because of the Mexican exclusion law that implicates me. Don’t say that everything within is Western style. Poem 135 was found on the walls of a lavatory room on the first floor of the detention barracks. Photograph by Mak Takashi. Courtesy of Phillip P. Choy. What can the stories of the Chinese immigrants on Angel Island tell us about contemporary immigration issues? The oral histories of Chinese immigrants on Angel Island attest to the hardships and indignities they had to suffer and endure because of a racist immigration system. But through perseverance and hard work, they eventually succeeded in making a new life for themselves and their children in America. In 1943, Congress repealed the Chinese Exclusion Act as a goodwill gesture to China, an ally to the U.S. during World War II. Chinese aliens were finally able to become U.S. citizens, but only 105 Chinese were permitted to immigrate to the U.S. each year. It wasn’t until Congress passed the Immigration and Nationality Act of 1965 that the last vestige of racism was removed from our immigration laws and every country was put on an equal footing. Today, fifty years later, we find ourselves with another broken immigration system: 11 million undocumented immigrants living in the shadows of society with more attempting to cross our borders every day; 400,000 immigrants are detained every year in government and private prison facilities for months at a time and in far worst conditions than at Angel Island; and there is a long waiting list of Asian applicants trying to join their families in America as well as a backlog of visa applications for high-tech jobs. Let us not make the same mistakes. As we search for a way to fix our immigration system, we would do well to heed the lessons of Angel Island and of what can go wrong when our immigration policies do not live up to our ideals as a nation of immigrants with liberty and justice for all. Judy Yung is professor emerita of American studies at the University of California, Santa Cruz, and the author of Unbound Feet: A Social History of Chinese Women in San Francisco and Angel Island: Immigrant Gateway to America. The book was coathuored by the late Him Mark Lai and Genny Lim, a native San Francisco poet, playwright, performer, and educator. She is the author of three poetry collections and the award-winning play Paper Angels, about Chinese immigrants detained on Angel Island. Deaconess Katharine Maurer with women and children on rooftop of the administration building, c. 1930. Courtesy of California State Parks, 2014.